Hi friends! I am late to the party but wanted to get my blog post up before the Bloggers' Quilt Festival deadline. Looking back, I realized I've only completed two quilts since the last Quilt Festival in May, so I decided to finally finish up my scrappy trip-along quilt. I made two of the blocks in this quilt and had my friends in the Believe circle of Do Good Stitches make two block each as well. For the color scheme, I asked for red, yellow, blue, a neutral (white, black, tan, off-white), and an obvious dark or light for the center diagonal. Then, last summer, I took it with me to Utah and quilted it on my mom's longarm. Which was fun... but I ran into a snag because my backing fabric wasn't long enough. It would have been fine for pin-basting and quilting on my domestic machine, but it should have been a few inches longer to work right with a longarm setup. So after we came home, I put it away for a while. But all I had to do to finish quilting the last few inches was sew a small additional piece of fabric to the back, do 5 minutes of quilting, and then it was ready to bind. It feels good to finish up a quilt again! I quilted it mostly with loops but also tried out a few swirls and other designs too. It was much faster to quilt this way than my normal quilting set up, but also a bit challenging because of the differences. I really like how it turned out and how gray-day photos sometimes look better than you think they will. 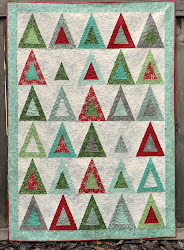 If you want to make a quilt like this, check out the tutorial by Bonny from Quiltville. Please visit Amy's site and check out all the other quilts! Thanks, Amy, for all the hard work that goes into hosting Blogger's Quilt Festival for us! 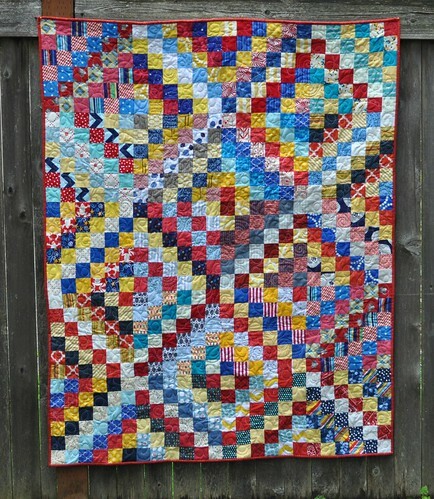 I love scrappy trip quilts and yours is a beauty!! I love that it is so colourful! Great scrappy trip! And good choice to have an obvious light/dark center - it has such a strong visually cohesive look that sometimes gets lost in scrappy trips. So pretty! 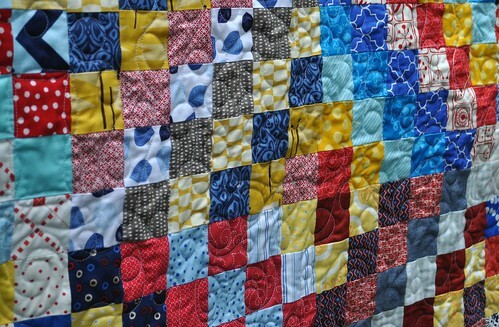 I love your colors and the quilting is awesome.